Swimming and surfing in an ocean filled with sharks is possible to do safely. The important thing is to use common sense when doing so. Sharks are at the top of the food chain in the ocean and must be respected. While no advice is going to keep you 100 percent safe, here are some tips to minimize your risk of being attacked by a shark. The first step to staying safe from shark attack while swimming is to stay out of the water during the sharks feeding times. 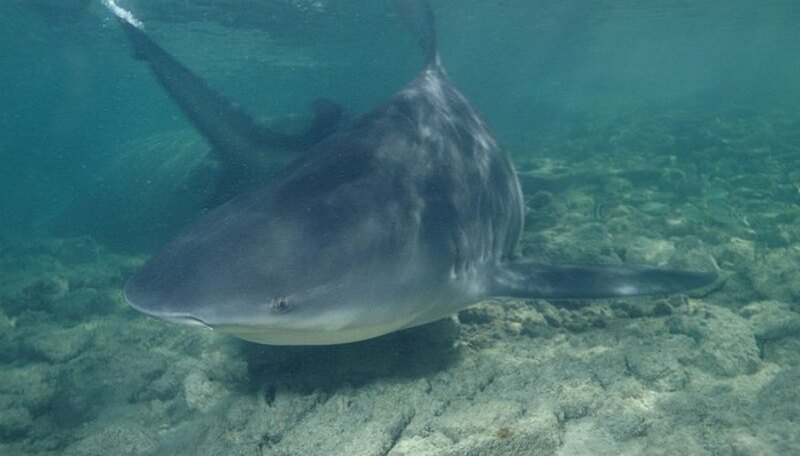 Many species of shark are known to come closer to shore during dusk, dawn, and night time hours. Do not swim or surf during these high risk time frames. Make sure that the beach you are going to swim at is patrolled by lifeguards. Having a lifeguard present and looking out for everyone in case of emergency can make a huge difference. If a particular beach is known for shark attacks, take a pass on swimming there. The odds of you actually being attacked by a shark are slim, but why take a chance if you know they are around? Leave Fido at home. A dog swims just like a meal to a shark and will attract attention. Make sure that you leave the pets at home for your beach trip or at least keep them out of the water. Always swim in the ocean in groups. Sharks are predators first and foremost. They will seek out prey that is isolated more quickly than those that are not. Make sure that you are not bleeding at all. Any open sore, cut, or even a menstruating woman will be like a beacon to any shark in the area. It only takes a drop for them to notice you. Stay away from the channels and anywhere where the water is murky. This can lead to the most common type of shark attack. Sharks generally do not target humans. Most often the shark mistakes people for their normal prey, seals. Thus, murky water can lead to a misidentification. Do not splash excessively in the ocean or swim in a wild fashion. This again can lead to accidental attack. Do not wear highly contrasting clothing or shiny jewelry in the ocean. A shark sees this quite well and will be attracted to the contrast. Wear dull colors that are of one color. Always keep your bearings and always pay attention to those around you. Keep an eye out for erratic fish and the like. If you feel uncomfortable for any reason, get out of the ocean. Southern, Rodney. "How to Stay Safe From Sharks in the Ocean." Sciencing, https://sciencing.com/stay-safe-from-sharks-ocean-2282849.html. 24 April 2017.